The National Thoroughbred Racing Association (NTRA), Daily Racing Form (DRF) and the National Turf Writers And Broadcasters (NTWAB) today announced that Ramon Dominguez, the Eclipse Award winning jockey of 2012, will receive his bronze statue on Sunday at Saratoga Race Course in a special winner’s circle ceremony scheduled for 2:30 p.m. ET. 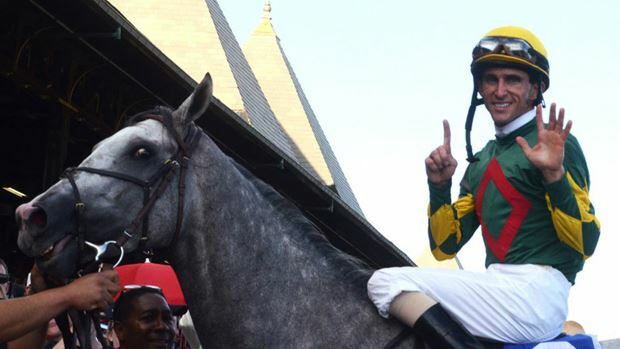 Dominguez, 36, officially retired from riding on June 13 after suffering head injuries from a spill in a race at Aqueduct Racetrack in New York on January 18, one day before he was to fly to south Florida to attend the 42nd annual Eclipse Award ceremony at Gulfstream Park Racetrack and Casino as a finalist in the Outstanding Jockey category. Dominguez won the award the following evening, and the trophy was accepted on his behalf by fellow riders Javier Castellano and John Velazquez, who were the other two finalists in the Outstanding Jockey category. Dominquez won the Eclipse Award for the third consecutive year. “On behalf of our fellow Eclipse Award voting organizations, the NTWAB and Daily Racing Form, we look forward to honoring Ramon on Sunday by presenting his award in front of his colleagues, family and fans at Saratoga, where he has some of his greatest triumphs in a career personified by tremendous skill, courage and class,” said Alex Waldrop, President and CEO of the NTRA. Dominguez, a native of Caracas, Venezuela, won 4,985 races from 21,267 starts and finished his career with earnings of $191,615,698. In 2012, he set a new single-season earnings record when his mounts brought home $25,582,252 to break the mark of $23,354,960 set by Hall of Famer Jerry Bailey. On July 22 of last year, Dominquez became just the second jockey in history to ride six winners on a single card at Saratoga. He won six races again on the September 2 program. During last year’s Spa meeting, he won the Jim Dandy and the Travers Stakes aboard Alpha, the latter race resulting in a dead heat with Golden Ticket. Dominguez also won his second Saratoga riding title, now called the Angel Cordero Jr. Award, setting the all-time record for wins with 68 for the meet. The 43rd annual Eclipse Awards, presented by the Daily Racing Form, the Breeders’ Cup and The Stronach Group, will be held January 18, 2014 at Gulfstream Park Racetrack and Casino in Hallandale Beach, Fla.